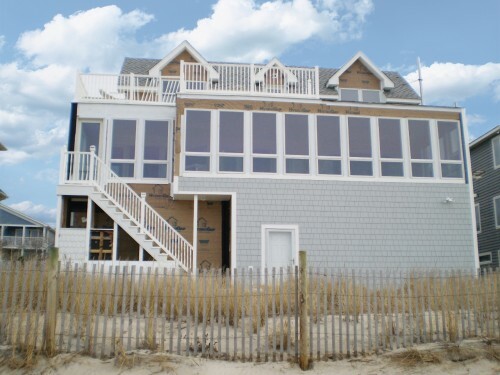 OneCall Services, a full service home remodeling company based in Lewes, DE, selects HydroGap® Drainable Housewrap as a vital component of large-scale repairs to a Delaware Bay home. The project is the latest example of how local builders and remodelers are adjusting their moisture management plans to include advanced systems that can endure the nation’s most severe weather. The home needing repair is one of many in the Delaware Bay area constantly pummeled by the region’s heavy winter snows, harsh summer thunderstorms and unstable coastal weather. Its original housewrap prevented the wall structure from breathing, allowing intruding moisture to sit in the wall assembly and force its way into the structural elements. Though the home is only six or seven years old, many basic building practices were not completed properly with the original cedar shake siding, leading to rot, mold and additional decay. As a result, HydroGap was chosen as the ideal long-term solution for moisture management. View the video below for interviews from the OneCall Services crew and to see HydroGap installed on location in Lewes, DE! Be sure to check out the full case study. Thanks again to James, Dominic and all the guys at OneCall Services for choosing to Build Better with Benjamin Obdyke’s HydroGap! For more information on OneCall Services please visit them at www.onecallservices.biz or reach them by phone at 302-645-9008.